I hate the Rolling Stones. I hate their music, and I hate what they stand for: denegerate living and drugs. But there was a time when I loved their music. That was because there was a time when the Stones played blues. The real stuff. Little Red Rooster, King Bee. It didn’t last long, maybe a couple of albums at best, but it was good, clean, honest music. Great for basement bands like ours to copy: simple progressions and dynamite licks. The Stones moved on, as bands do, but I never lost my love for the Blues, I just migrated to other artists. The great of draw of Jimi Hendrix and Eric Clapton was not their psychedelic heavy metal sound, but their blues roots, leading back to B.B. King and the Chicago blues. The blockbuster hits of those days for blues fans was Big Brother and the Holding Company and Janis Joplin’s Ball and Chain from their Cheap Thrills album and East-West by the Paul Butterfield Blues Band, featuring Mike Bloomfield and Elvin Bishop. It was wonderfully powerful and driving stuff. I’m sure music didn’t entirely die in the 80s. There was Genesis and Pink Floyd and of course Queen. But lyrical and gutsy music music was at at a premuim. For a while I gravitated over to country music, just to see what was going on, and found John Hiatt hiding out there. His 1995 album Walk On was about the only thing I listened to for about five months. It’s as close to a cross between Bob Dylan and B.B. King as you can get. Dust Down a Country Road, and Cry Love stand out on a great album. Here’s a link to John Hiatt’s Riding with the King, performed by B.B. 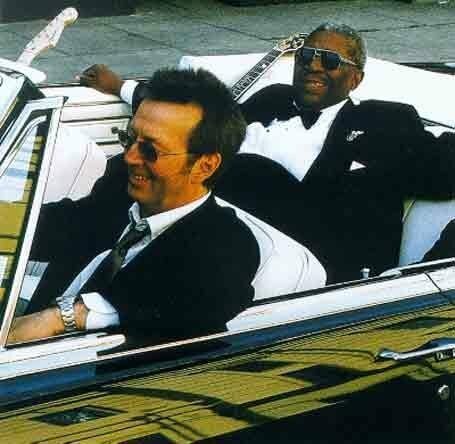 King, for whom it was written, and his old friend Eric Clapton. This album has been getting me through the long slog of marking exams with a bit of a grin on my old tattered face. I hope it puts a smile on yours. I credit the Cosby Show for any knowledge I have of BB King or the Blues. Not that I have any knowledge!